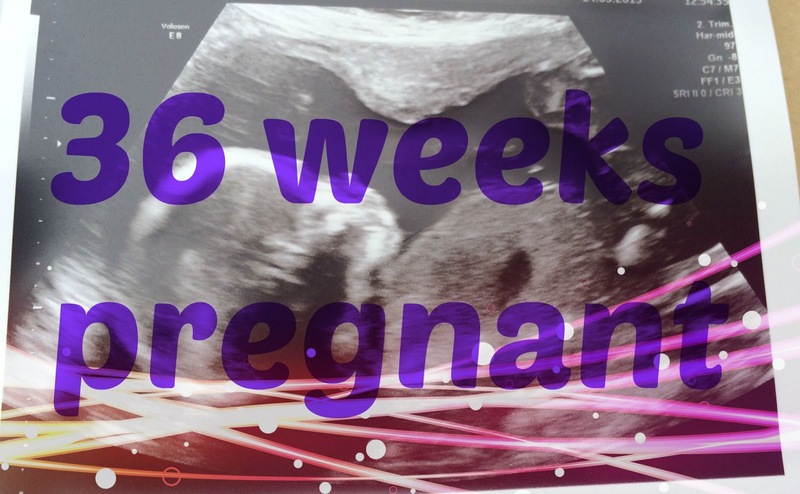 At the start of pregnancy I was doing regular updates but as this pregnancy has advanced I have gotten more and more tired to the point where I just could not think about blogging to much. Add to that a cough and a cold that I have had for a month now, pregnancy updates have kind of been forgotten. Anyways I am 36 weeks pregnant and have been attending the maternity unit every two weeks for blood pressure checks due to raised bp and fear of pre-eclampsia at 28 weeks. Thankfully it seem that that was a one off and since then my bp has been lowering and when I had my appointment yesterday my bp was the lowest it has ever been during this pregnancy! Good news. Baby is head down but free which disappoints me a bit as M never engaged which was why we got induced and even when induced she never engaged. I had hoped this baby might engage early to give me some hope of having a normal birth. There is still plenty of time so I won't get too worried yet. I guess it is time I start thinking about packing my hospital bag sometime soon! I have a anterior placenta (or so I read on my 20 week scan notes) and so I had presumed I would not feel as much movements as I did with M. Let me assure you I was so wrong. I would actually say that I feel so much more kicks and movements from Button than I ever did with M. The movements are also much stronger than I think I felt with M and on a few occasions they have actually given me a fright. I have never had any real worries about movement with Button, only when I have been super busy all day and not had a chance to notice them. Honestly? I am absolutely shattered now. I feel like I am running on fumes. At night I am maybe getting two to three hours maximum and this is really starting to take its toll. Rib pain has been an on going problem but generally only at night time. Thankfully as I am at home all day, rather than in the office, I can lie in comfortable positions or find a way to sit that doesn't hurt my ribs. This has really helped this time round. Heartburn hasn't really been a problem recently. In fact after I forced hubby out late one night to get some (and he came back with liquid instead of tablets and was sent out again) I actually haven't really suffered much from it. Swelling is minimal. I still have my wedding rings on which we are sure came off, forcibly, before our 20 week scan with M.
Not long to go now. Keep your eye on swelling and BP - pre eclampsia can come quickly and I got it at 36 weeks with D. Scary stuff but I went on to have a normal delivery. Don't worry about Baby engaging. Neither D or E engaged until the point of birth. I remember the sleepless nights at the end of E's pregnancy but I didn't get the tiredness thankfully - I suffer that at the beginning! Keeping an eye on things but so far so good. Have appoint in week and half then I think I will be every week after that. Hoping to be induced earlier than with M too so hopefully I can avoid it this time.